The post, which was widely read and a version of which also appeared on Huffington Post, refers back to the 1999 Financial Modernization Act, in which the US Congress took another step toward deregulation of the banks, removing more bricks from the wall between government-insured banks and the non-bank institutions. I said the Economist magazine was correct in 1999 when it said that the implication of weakening the Glass-Steagall wall should be to extend the net covered by U.S. financial regulation. The implication of a story in today's New York Times by Gretchen Morgenstern is that my thinking in March 2008 was on target. Financial regulators in New York and Washington at that time were dissing the "pessimists" who were concerned that banks were under-capitalized. The pessimists were worrying about the risky behavior of the unregulated sector of the economy and the porous nature of what was left of Sen. Carter Glass's wall in the Banking ("Glass-Steagall") Act of 1933. Here is Morgenstern's story, based on reviewing 2,000 pages of transcripts just released by the Fed. Comment on CityEconomist Readership: The CityEconomist blog just passed 70,000 pageviews. The previous marker was 60,000 in October 2013, so that's 10,000 pageviews in four months, or 2,500 per month, roughly 100 per day. The blog was started in the first half of 2007. I did not post during a two-year break while I was working in Washington for the Joint Economic Committee, but the blog was open and the pageviews kept coming, so it is fair to pin the average pageviews per year at about 10,000. So the recent rate of viewership is three times the average over the life of the blog. Thank you for reading. OURO PRETO, Brazil. I’m here in Brazil for about three weeks, away from the snowstorms and ice, and my first stop was in the most populous city proper in Latin America, Sao Paolo. Its metro area is about the same size as Mexico City's, 21 million. These two cities are significantly more populous than the third-place New York metro area, which has a population of 19 million. Some news is delivered in single spies, other news in battalions. Sao Paolo is facing the end of half of its water supply in 45 days. 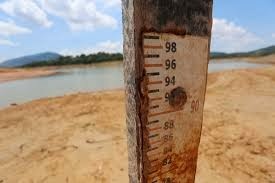 It's one of the main sites for the 20th FIFA World Cup, and the idea of water rationing during the month (June 12-July 13) of the World Cup is causing local consternation. 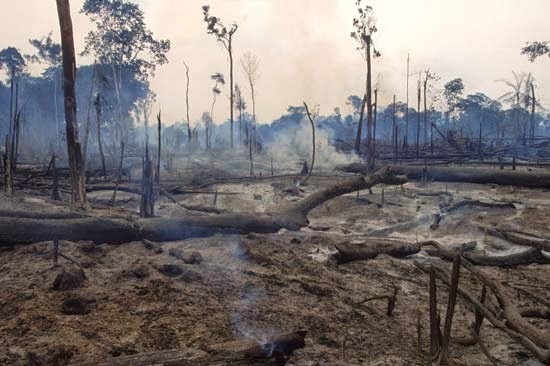 One suspect is the shrinking rainforest. Nature has responded to the shrinkage of the forest cover by reducing rainfall. As yield per hectare has fallen, the demand for new farmland has continued. The cycle is unmistakable, but the message is muted by the fact that it has been happening incrementally. Now, the severe drought is delivering the message of interconnectedness and crisis. Loss of rainforest is a global problem and a local problem. Given that the Amazon rainforest has been a top cause for responsible consumers and investors - and for environmental groups, many of which are headquartered in New York City - why has the rainforest continued to shrink? Can we pinpoint the guiltiest parties and do more to save the rainforest and planet Earth? the lungs of the earth, the means by which we renew the planet’s oxygen supply. Environmental groups frequently show pictures of threatened exotic rainforest birds, other animals or plants. The Amazon rainforest is home to 40,000 plant species, 427 mammals, 1,300 birds, about 800 reptiles and amphibians (snakes, lizards, frogs, toads) and some 3,000 fish species. protection of animal and plant diversity has been based on preserving access to potential future cures for cancer or other human diseases or ailments. It was one of the earliest themes cited by American social ventures that looked for causes to which they could link their brands. Ben & Jerry’s, for example, back in 1988, was looking for a new brand to tie to the protection of the rainforest. The product they came up with was Rainforest Crunch ice cream. The Body Shop in the 1990s sought customers by claiming their product not only included exotic oils and plants but were helping ensure sustainability of the Amazon rainforest. The Rainforest Alliance has even built protecting the rainforest into their name and their tree-frog logo. If corporations can win public approbation for championing the sustainability of a single bird, for example, what better cause than championing the protection of the area that is home to many, many threatened species? The deforestation of the Amazon rainforest in the last 50 years has been alarming. 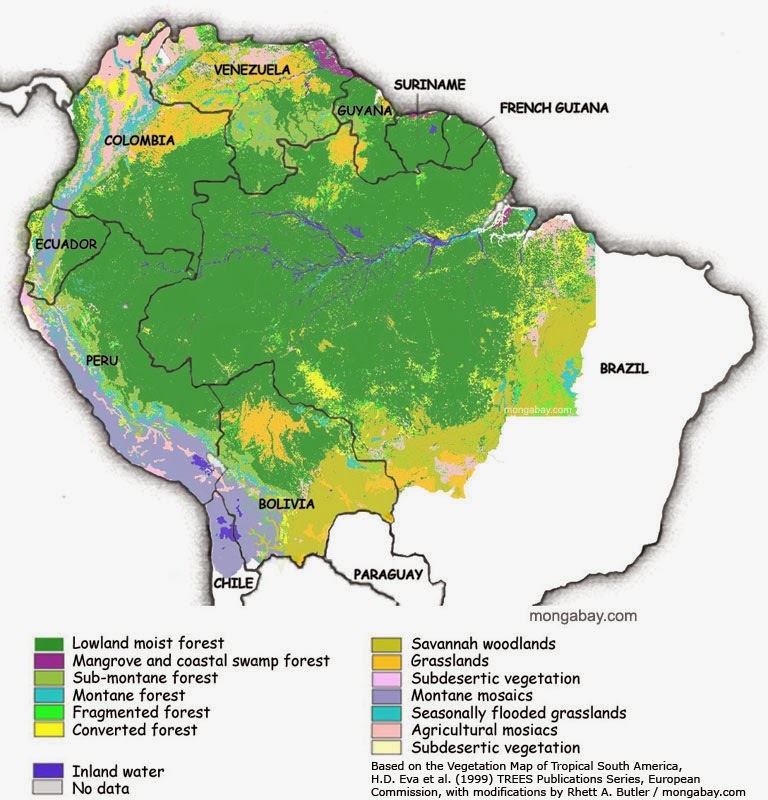 The average annual loss depends on what time period you look at, but a Brazilian told me the annual loss of Brazilian rainforest over the decades has approximated to the size of Belgium, nearly 30,500 square kilometers (about 12,000 square miles). Belgium is about the size of Maryland. The figures I report below show that in some decades the loss has been more than the size of Belgium, sometimes less. The 1990s pleas of environmental organizations seem to have fallen on at least partially deaf ears. The decade of the 1990s was worst ever, as the loss in the total Amazon rainforest in Latin America is estimated at nearly 590,000 square kilometers, the size of Spain. This is an annual rate of loss equal to double the size of Belgium. The rate of deforestation in recent years has been slower. However, the forest continues to shrink. 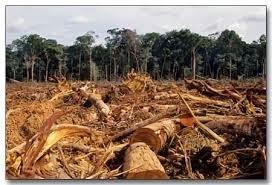 The main driving forces for deforestation are a need for housing and the economic incentives for switching land from rainforest use to any other use. About 70 percent of the lost forest has been replaced with grazing areas. Cattle ranchers are sometimes fingered as a driver for rainforest loss. The ranchers respond that they simply move in on cleared areas, and that the real driver is demand for wood for building in Sao Paolo and other cities. A little history might help here. Before the Spanish and Portuguese colonists arrived, the Amazon basin is believed to have been densely populated, with much of it farmed. The rainforests were not as extensive as they are today. A united Spain and a prosperous Portugal set out to create empires. Spain started by defeating the Incas and the Aztecs. The Portuguese colonial invaders exploited the sugar cane production and then moved up into Minas Gerais to mine gold and other metals and diamonds. To provide labor for these enterprises, indigenous populations were enslaved and Africans were brought to Brazil - by 1800 Africans constituted half of the population. Through conquest and death from European diseases, the Amazon basin became depopulated. The rainforest spread to where farms had been. The peak of the Amazon rainforest was probably in the mid-20th Century. Deforestation was speeded up by highways that made access to the rainforest easier. The marketplace. The price of soybeans goes up, and more farmers want to grow soybeans. The price of soybeans goes down and farmers want more land to offset the loss of value. In 2003, the peak year of deforestation, more than 20 percent of the Mato Grosso state’s forests were converted to cropland, largely for growth of soybean farming. Small farmers. The rainforest has become host to smaller farms starting in the 1960s. They have used unsustainable farming methods, which meant farmers got used to depleting the soil. Their solution was to move on to new areas. Loggers. Loggers cut down the trees using the clear-cutting method instead of the more sustainable harvesting approach. They cut down rare old trees that should be protected. Cattle ranchers. They create incentives for clearing the land because they will buy it. They can use almost any cleared land because they require few workers (not counting the animals) and cattle only need to eat grass, whereas the soil needs of sugar cane, coffee or rubber trees are greater. Real estate speculators. The large - tenfold - increase in value of land for grazing over forest land is believed by some Brazilians to create incentives that lead to such actions as owners starting forest fires so they can realize a sale of their land quickly. Government education. Governments should be doing more to educate farmers about sustainable farming, which a recent post on Grist advises is about “math as much as mulch." Government road-building. The Brazilian government has built three highways with unintended consequences - the Belem-Brasília federal highway in 1958, which enabled two million new settlers in the next 20 years, the Cuiaba-Porto Velho highway in 1968, and the Trans-Amazonian highway of 1972. Unlike a mystery story, finding a single culprit is impossible. We are all part of the problem. Solutions depend on getting as many stakeholders at the table as we can. Consumers should demand sustainability in the products they buy. Businesses should contribute through trade associations to a culture of compliance and, beyond that, to certification of sustainable practices. The Brazilian government and state and local governments need to enforce sustainability laws as well as create new policies. One promising development was Norway's 2008 commitment of up to $1 billion over seven years to Brazil's Amazon Fund. The Fund is set up to slow down the deforestation of the Amazon, for example by providing technical assistance and financial incentives to states and localities in Brazil. The British Overseas Development Institute has attempted to evaluate such "climate finance" programs and suggests they need more analytical support, and that partnerships with business are a potentially fruitful direction. But the BBC's climate correspondent does not see a Global Climate Fund getting under way as quickly as it expects. 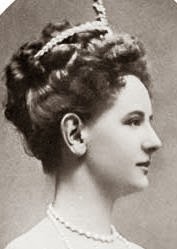 As Nature turns the screws a few more times, we can only pray she gets more attention.